Every week, at a show or store locations, we hear “Heisey Glassware is the best glassware ever made”. It is difficult to argue this, as Heisey did have their own unique recipe. Many other companies experimented, but no other competitor could match the design, brilliance and quality of the Heisey Glass Co. This article is dedicated to the evolution of the Heisey Glass Company, and the history behind the man who made the best quality and clarity of pressed glass in North America, Mr. Augustus H. Heisey. Augustus H. Heisey was born in Germany in 1842. He came to the United States in 1843, and found a home in Pennsylvania with his family. After graduating school, at the age of 19, he began to work for the King Glass Company, in Pittsburgh PA, as a clerk. This must have been when his passion for the glass industry first developed. In 1862, he left the company to fight alongside his fellow Americans in the Civil War. He remained dedicated to the war effort until his discharge in 1865. After he was discharged, he returned to the King Glass Company, but only for a short period of time. Augustus then found a job working for the “Ripley Glass Co.” as a salesman. Shortly after, he met Susan Duncan, who was the daughter of George Duncan, a part owner of the Ripley Glass Co. They fell in love, and were married in 1870. In 1874, he gained a 25% interest in Ripley Glass Co., and the companies name was then changed to “George Duncan and Sons”. In 1879, Augustus Heisey and his brother in law James Duncan, joined a partnership and became site owners of the “George Duncan and Sons” factory. 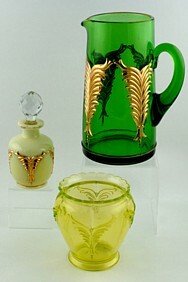 It should be noted that the Duncan Glass Company produced several spectacular patterns such as “Three Face” and “Shell and Tassel”. At this time, competition in the industry was fierce. Many companies were struggling to stay afloat, and many amalgamated with other companies to alleviate financial woes. The “George Duncan and Sons” factory was no exception to this problem. There were so many companies in production, that by the 1880’s, the demand had softened as the production of pressed glass had surpassed the need. George Duncan and Sons were one of the first companies to join “U.S. Glass” in 1891. They too were having financial problems. Augustus then changed careers and began to work in the mining industry, but only for a couple of years. He never lost his passion for pressed glass or the industry. He knew that he needed to find several important components for a chance at a successful business. This included a strong work force, a need to be close to natural resources and a solid plan to begin his factory. He believed then, that he could make his company unique, and could possibly launch a successful business that would be competitive and bring forth new ideas, designs and patterns, which might re-inspire. It was a risky business move, but he went ahead with his dream and began building his factory in 1895. The location he chose was in Newark, Ohio and the official opening day, for his small factory, was recorded in April 1896. This is when he excelled! Heisey made many important decisions regarding the company’s product and production lines. The pressure was on to make a name for himself and become recognized. He was about to compete with the U.S. Glass Co., who bought out the majority of the competition and was narrowing the North American market. Knowing this, he needed an edge, something that would make him stand out from the rest. His focus was to create the perfect recipe, a glass that was so clear, that consumers would go out of their way to buy it. His idea was to find the best quality ingredients (hopefully secret sources) and gather these ingredients from around the world, and not just locally like other glass companies. He spared no expense with this risky move. Importations of ingredients came from around the world, including Chile and his birth place, Germany. In doing this, he had essentially, created the perfect recipe, or as perfect as could have been, for the time period. Mr. Heisey then turned his focus to the mold designs. While other companies were focusing on elaborate designs, he followed a different path. Although, the company made a few elaborate designs, many of his patterns were designed with simple lines and shapes, and created some of the most elegant designs ever made, not knowing that years later, his designs would continue to be loved. He also focused on the forms that were made, creating new shapes and functional forms that had not yet been invented. Mr. Heisey then took one more step, by hiring extra staff for the “finishing” departments. The finishing of an item included “fire polishing” rims, grinding out roughness and for finishing touches such as stretching glass, manipulation of the form, application of blown glass handles and hand painting or decorating the glass. The Heisey Glass Co. quickly climbed the ranks and was recognized almost instantly. 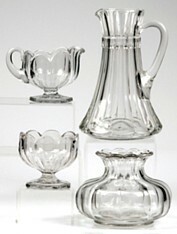 Shipments of Heisey Glass were sent throughout North America, and even internationally. Shortly after the launch of this company, he re-tooled his molds to include his glass signature, a signature that is still recognized and highly sought after today. He had realized his dream. There is much confusion about when the company began using the trademark, “H” inside a Diamond Shape, signature. The design of the signature was created by Mr. Heisey’s son, named “George Duncan Heisey”. It was registered with the U.S. government in 1901. We do know that items without this signature, were identified with a paper label, and so any items made pre 1901, will not be signed. It is also known that the company did not re-tool all the molds to incorporate the signature, but all new molds designed after the signature was registered; do have the Heisey trademark H. Often the signature was discreet. We have seen signatures on the underneath of items, the bottom of fruit bowls, the stems of goblets, underneath bowls of pedestal items, often on the side socket of candlesticks, etc. Learning to recognize the style of patterns, the crispness of his designs and the quality of the glass is not difficult. There is something both unique and charming about the colour and brilliance of Heisey glass that no other company could come close to mimicking. Those who lack the confidence of recognizing unsigned items, often find great comfort in collecting only those with the signature. 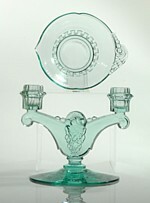 An easy way for collectors to identify Heisey Glass, just look for the H set inside a diamond shape. 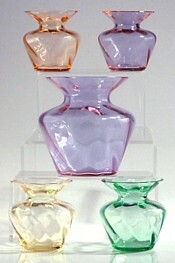 Heisey Janice Vase #4220 – 1925–37 – part of a series of four different shaped blown vases. In 1922, Augustus Heisey passed away. At this time, his son named “E. Wilson Heisey” became president of the company. The market had now changed, and colored glass was in demand. There were several reasons the public demanded colours. Other companies had begun advertising their wares as a great way to spend little money to enhance your table and “brighten your day”. The idea of an entire table service in colour, during the Depression, combined with the fact that even the most unfortunate household could afford it, brought a whole new industry for glass manufacturers. As the clear glass recipe had been perfected, it was now time to move on, to the challenge and birth of new colours and recipes. 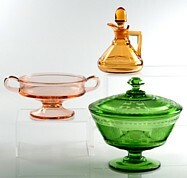 In keeping with Augustus Heisey’s ideas, chemists were hired by The Heisey Glass Co., to create new colour recipes. The idea was to launch a unique line of colors, exclusively their own. They hired the scientists, to understand the make up of sand, how to effectively mix ingredients, which chemicals could be mixed and the outcome of each component. 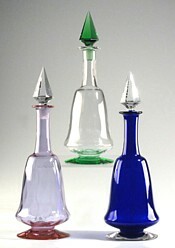 Again, The Heisey Glass Co. broke tradition and put great time and money into the creation of their colours. While most companies produced similar colours, Heisey’s were much different and no other company could figure out their secrets and techniques. Success once again, and they continued to flourish. Heisey Fern #1495 – 1937–1941 – made inCrystal & Zircon (pale aqua). Items pictured:2-lite candlestick; Jelly. In the year of 1942, Mr. E. Wilson Heisey (Son of Augustus), passed away. This gave way for his brother, J. Clarence Heisey, to become the next president of the company. This was the beginning of the company’s struggle. With World War II, the conditions of the industry changed, and competition was at its peak. During this time, The Heisey Glass Co. introduced a series of figural animals. This introduction helped keep the company afloat, into the 1950’s. The struggle continued and by 1957, when the company was experiencing serious financial problems, they closed their doors indefinitely. 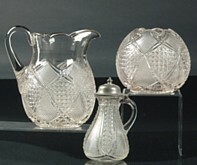 As a means to create funds, the company sold their assets to the Imperial Glass Co., who continued to produce some of the famous Heisey patterns for many years to come, without the trademark H. It is now over 50 years since The Heisey Glass Company’s closure, and the legacy still lives on, with another generation of collectors. 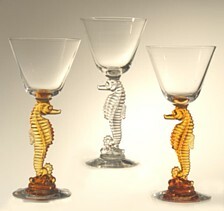 Heisey Seahorse cocktail #5074 – 1950 – made in all crystal and with a Sultana (amber) stem. Marked on top of stem. out to do and created the most famous patterns and colours in pressed glass ever made, and received recognition from consumers and collectors, for his hard work and dedication. Mr. Augustus Heisey’s name and dream, is now a legendary part of our history. Heisey Candlesticks, Candelabra and Lamps, by Tom Felt and Bob O’Grady. Copyright 1984, by the Heisey Collectors of Ameirca, Inc.
Heisey’s Glassware of Distinction, by Mary Louise Burns. Copyright 1974, Published by Mary Louise Burns.